The “Deluxe Version” of this album contains 4 bonus tracks only available digitally. Not since N.W.A. first changed the game, has a clique of West Coast MCs taken grip of the microphone with such a blatant disregard for representing anything but the reality of their surroundings. 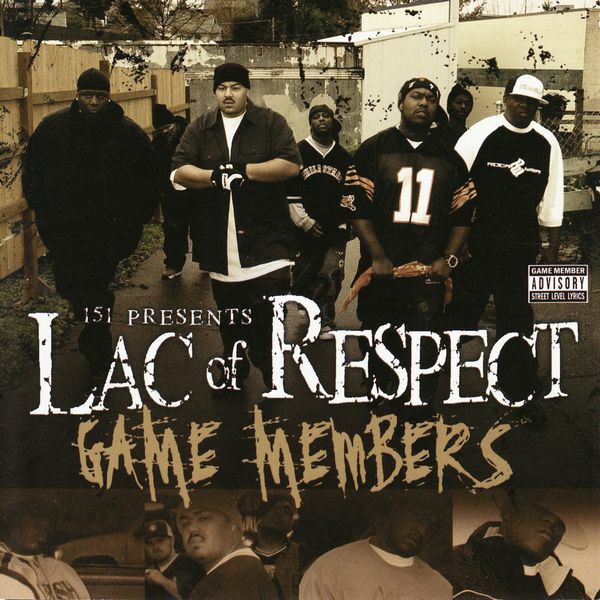 Just as the pioneers of gangsta rap put Compton on the map, Lac of Respect’s debut album, “Game Members” has already started to bring added notoriety to the streets of Seattle. Representing the 206 from the South End to the West Side, “Seattle’s most dangerous group” is a deadly combination of Left Coast underground all-stars whose combined portfolio of work has appeared on over 50 albums to date. Consisting of 151 (“Code of the Street”), Skuntdunanna (“The Streetz Iz Enough”), Twin-G (“In Tha Name of Game”) and one of Puget Sound’s grittiest new voices, A-Train; Lac of Respect’s authentic content and unique delivery provides Hip Hop with a view of Seattle’s rap scene that doesn’t beg for your attention, it steals it with a .45 to your head. The CD version of this album is out of print and only available digitally now through all major retailers. “Game Members” features the hard-hitting crowd favorite, “Fucc U” and is backed by 16 other tales of hustling and uncensored gangsterism including “That’s How We Do It,” “Brain Surgeon” and “When A Thug Iz Fed Up.” “Disappearing Acts” details the raw emotion and reality of growing up without a father and provides a deeper view into the personal lives of the Lac crew. Capturing every aspect of coming-up and surviving in the streets of Seattle, Street Level Records, Skunt Muzik and Power Move Ent. serve up a soundtrack for the streets that the hood can be proud of. Succeeding in providing the rap scene with a completely unique sound, Lac of Respect carefully selected a diverse set of beats for “Game Members” from the Northwest’s top up-and-coming beat-smiths including D-Sane, Roc’phella, Todd Brown, Bean One and the group’s own Skuntdunanna.